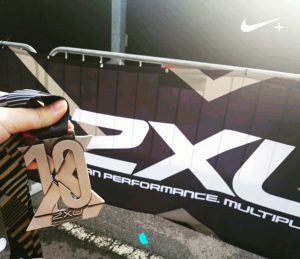 Race Review: 2XU Compression Run 2017 [10km] (by Jilian) | JustRunLah! It’s been a long time since I run a 10 km race and I’ve decided to start running again with 2XU. I chose 2XU mainly because I’ve never tried it before and it seems like a popular run. I mean… if it’s popular, there must be something about it that appeals to runners right? I joined the run today at its flag off time of 6.45 am for the 10 km race. The sky was just starting to brighten up and so was my mood when I listened to the heart-pumping songs blasting loudly at the start pen. Everyone was ready for the run and at 6.45, we were flagged off! The routes for this race were wide for most parts with only some narrow parts here and there (I think about the 6 km mark?). But I had a rule for myself, which is to keep running if I’m on narrow roads so I don’t block up the road. I only allow myself to walk when the road widens up. And fortunately/unfortunately for this race, the narrow parts happened to be at the areas where I felt tired and wanted to walk. But thinking that it would not be nice for me to walk and slow down other runners, I kept my pace and continued on. And maybe that is why I did better this race! Although it’s not my personal best, but my pace was pretty close 🙂 But that’s not a reason to have more narrow roads during races though! Just to be clear about this. I love the route planned out by 2XU though. I love it because the routes were not planned in a loop as with some other races where the U-turn was rather sharp and you had to run back the way you came. In this race, the U-turn requires us to cross a bridge to the other side of the river and so the view is rather different! And not to mention that the view at Singapore River is so scenic that I might actually be biased. Anyways, the race went off smoothly without any problems. There were ample hydration points (I think there’s 4) but there’s not enough volunteers at the hydration point at Marina Barrage. Runners had to stop and queue for their drinks… That’s the only hydration point I encountered that required queuing. The rest were fine! The last 1 km felt rather long though… like it was longer than 1 km. My Nike+ Run App indicated that too… But nonetheless, I kept going while I strain my neck to find where is the finishing point. It got my mind off running for sometime and when I saw the Finishing line, I was so happy! The performance with the drums at the side kept me going and I quicken my pace. The atmosphere near the finishing line was so awesome! But things started to slow down while we queued for our finisher medal. There wasn’t really any queue but everyone was patient as we waited. I didn’t have to wait very long though. The volunteers cleared very fast and off we go to the race village! Ok, I actually didn’t stay in the race village because I’m tired of queuing again. I saw the Instagram photo print out while I was on the way. I really love races that provides this service. It’s like letting us have our own personal momento! But like I said… I was tired and didn’t feel like queuing HAHAHA so I left. All in all, I am really satisfied with this race. It’s honestly the best race I’ve ever joined and I didn’t regret signing up for 2XU! I think they’ve probably got themselves a loyal runner! Hope that they would keep this up! Also of that opinion. Actually he is correct the distance is longer than 10km. My run keeper which is quite accurate shows 10.85km & my personal running timing is also consistent with that. The horror is the chip is at the end is not working showing DNF. I had wrote in on this. As per my Runkeeper record the route is 10.80km. It is too much different to ignore. Secondly, the 7.5km to 9km is too crowded to keep normal pace(10km runners met 21km walkers).. In the 2XU 10km route map, they have indicated the actual distance is actually 10.8km.